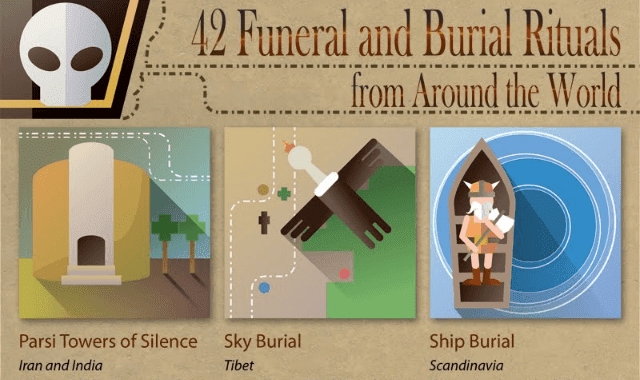 42 Funeral and Burial Rituals from Around the World #Infographic ~ Visualistan '+g+"
Everyone grieves in their own way. Across cultures, funeral and burial traditions are exceptionally unique. Aspects like burial, body arrangement, and funerary art are common general features - but how they are carried out can be very different from country to country. If you'll be attending a funeral or burial in another culture, you'll want to know for sure what to expect! We've put together a list of 42 customs that tell a history of human burial. Join us on an exploration of the land of the dead!